As I've said before, I'm not really into poetry. I have a hard time getting anything out it when I try to read it. But when it's set to music, it's a whole different story. 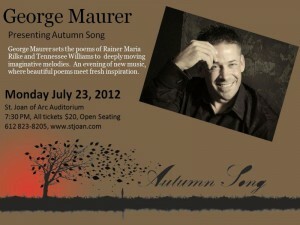 Accomplished local composer and pianist George Maurer has set several poems of German poet Rainer Maria Rilke to music, interspersed with a few poems by Tennessee Williams. 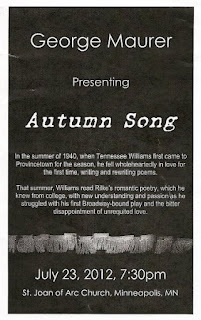 This initially seemed like an odd couple to me, until I learned that Williams was a poet in addition to being a playwright (one of my favorites), and he was inspired in his writing by the writing of Rilke. George and director Jef Hall-Flavin have imagined a dream-like conversation between the two, consisting entirely of music and poetry. A cross between a concert and a theater piece, Autumn Song doesn't have much in the way of plot or story, but instead it brings the poetry of Rilke to life. It's a beautiful creation. The evening begins with Jared Oxborough as Tennessee Williams entering like a character from one of his plays, like Brick or Stanley (and it was hot enough in the gym of St. Joan of Arc church to believe we were in Williams' Southern home). He begins reading a book of Rilke poetry, when the poet himself (played by Dieter Bierbrauer) appears as if in a dream. The two men interact and sing alternately or together, mostly Rilke poems and a few Williams poems as well. A few visions wander through, representing the objects of the two men's affection – Rilke's played by Dieter's real-life wife Anna, and Williams' played by Caleb Carlson, a promising young actor I've seen recently in Julius Caesar and Our Class. Despite the lack of dialogue or exposition, it's obvious that Williams takes inspiration from Rilke, so that by the time that Rilke leaves at the end of the piece, Williams is able to write again. Lord, it's time. The summer has gone by. On the meadows let the wind go free. The final sweetness to the heavy wine. As I've also said before, I'm a geek for the German language (see Werther und Lotte and Ich bin meine eigene Frau), having studied German at St. Ben's/St. John's like George did, where he was introduced to Rilke in his German classes. While Rilke's poems are translated into English for this piece, there's still that inherent German-ness in it that makes me want to attempt to read a few poems in the original language. 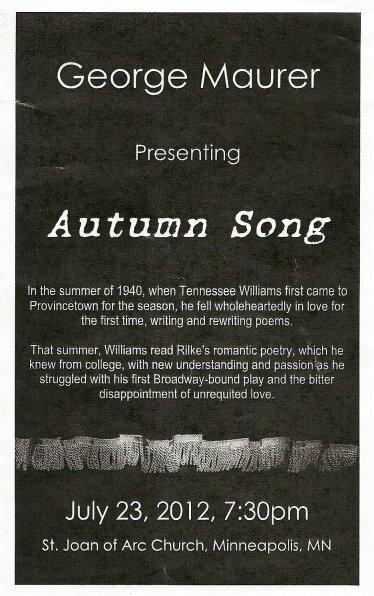 I'm only marginally familiar with Rilke, and with Williams only as a playwright not a poet. So I appreciate getting to know both of these artists and their work a little better. 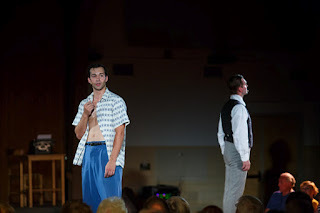 George and company will next take Autumn Song to the Tennessee Williams Theater Festival in Massachusetts. They have a Kickstarter campaign to help to fund this effort (click here to view video and back the project). I wish them much luck in this endeavor and am grateful to have gotten a sneak peek. I'll leave you with a few poems my Rainer Maria Rilke, as sung in Autumn Song (you can read the entire libretto here). My mind deepens into them. And held like a legend and understood. am I a storm, or an unfinished song? I'll go on hearing you. And without a mouth, I can swear your name. And without feet, I can make my way back to you. and my brain will start to beat. What is the deepest loss that you have suffered? If your drink is bitter, turn yourself to wine. The magic at the crossroads of your senses. And when the world no longer knows your name?